Del Webb at Lake Oconee in Greensboro, Georgia is one of the few Del Webb communities in the country located on a navigable lake. 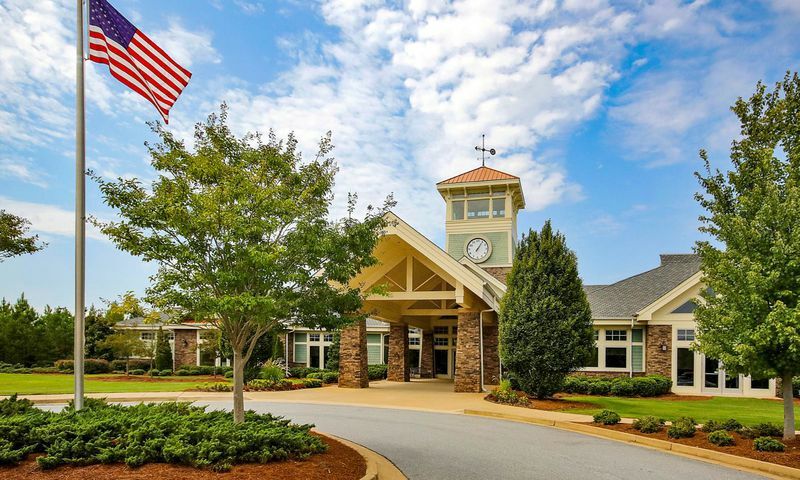 Situated 75 miles east of Atlanta, Del Webb at Lake Oconee combines rural charm with convenient access to the culture and entertainment of Atlanta. Residents enjoy a beautiful clubhouse as well as access to all of the wonderful recreation offered by Lake Oconee. The setting of Del Webb at Lake Oconee is unlike any other active adult community in the Southeast. The resort-like atmosphere is adorned with rolling hills dotted with towering pines and dogwoods. Over 30 percent of the community is preserved in its natural state and homeowners enjoy large homesites with over 20 feet of space between homes. The generous lot sizes and natural setting provide a welcome change from the more heavily developed neighborhoods and traffic congested roads closer to Atlanta. The community is wrapped around the shores of Lake Oconee, Georgia's second largest lake. The man-made Georgia Power lake stretches along 400 miles of twisting shorelines and includes 19,000 acres of navigable water. The lake is home to some of the best fishing in the Southeast and is stocked with four kinds of Bass, Crappie and Catfish. Plus, the shores of the lake are a haven for wildlife including deer, wading birds and bald eagles. Water sports enthusiasts enjoy all sorts of lake activities including boating, sailing, water skiing, kayaking and personal water craft. The hydro-electric power generating lake enjoys almost constant levels and is surprisingly one of the least crowded lakes in the region. Del Webb has 1,400 feet of direct lake access, which includes 38 boat slips, a boat launch and boat storage facility. At the heart of Del Webb at Lake Oconee is a 21,000 square-foot clubhouse and amenity center known as The Club at Lake Oconee. The clubhouse serves as the central hub for all community social and fitness activities. It includes desirable amenities such as a state-of-the-art fitness center with the latest high-end cardiovascular and weight training equipment. There is also an aerobics studio, indoor lap pool, arts and crafts studio, ballroom, library, catering kitchen, billiard tables and a card room. Outside, the clubhouse at Del Webb Lake Oconee is surrounded by four clay tennis courts, two pickleball courts, four bocce ball courts, horseshoe pits and a croquet field. There is also a softball field, dog park and miles of scenic walking and biking trails. A lakeside pavilion includes an outdoor fireplace, picnic tables and grilling area that is an ideal place for residents to gather and watch the sunsets over the lake. Del Webb at Lake Oconee began construction in 2007 and the community will be home to over 800 households upon completion. Homebuyers can select from 12 floor plans including duplex villas and single-family homes. The two duplex villa models are 1,217 and 1,393 square feet and include two bedrooms, two baths and a two-car garage. There are also a variety of single-family floor plans that range from 1,109 to 2,597 square feet, which include two to four bedrooms, two to three-and-a-half baths and two to three-car garages. Some of the single-family models at Del Webb Lake Oconee offer an optional second-floor loft that includes an additional bedroom, bathroom and recreation area. Homeowners can truly enjoy a maintenance-free lifestyle at Del Webb at Lake Oconee. The homeowners' association includes services such as lawn maintenance, garbage pickup, amenities access, common area maintenance, and guard gated security. Life in Del Webb at Lake Oconee is designed to provide residents the feeling of living in a resort-like setting complete with a variety of social and fitness activities. A community activities director is on-site to help custom build a lifestyle tailored to your interests. There are several dozen clubs and interest groups in the community that include everything from card and craft clubs to tennis, golf and water sports. An activities calendar is continually offering new and exciting community events and group trips to nearby attractions and neighborhood parties. Residents at Del Webb at Lake Oconee can truly enjoy their leisure time with so many fun clubs to join, such as book club, bible study, or the sassy stitchers club. Despite its somewhat rural setting, Del Webb at Lake Oconee is surprisingly close to a variety of great shopping, dining and entertainment venues. All the essential shopping requirements such as a grocery store and pharmacy are within 10 minutes from the community. Plus, there are numerous delightful restaurants within 10 miles. There is excellent healthcare nearby including the Medical College of Georgia and a division of St. Joseph's Hospital of Atlanta within 15 minutes. Del Webb at Lake Oconee is located directly between four large urban centers including Athens to the north, Atlanta to the west, Macon to the South and Augusta to the east. All are accessible within an hour or less. When residents of Del Webb at Lake Oconee feel the need to get out and explore, there are plenty of exciting destinations nearby. Atlanta is filled with great shopping, entertainment and culture venues. The University of Georgia in Athens offers performing arts and sporting events. And the nearby Oconee National Forest is great for hiking and outdoor recreation. Regardless of your passions, the cultural richness offered by Del Webb at Lake Oconee and its surrounding attractions are sure to appease your desire to get out and live life to the fullest. The Club at Lake Oconee - 21,000 Sq. Ft. There are plenty of activities available in Del Webb at Lake Oconee. Here is a sample of some of the clubs, activities and classes offered here. Duplex Villas range in size from 1,217 square feet to 1,393 square feet. These attached homes feature two bedrooms, two bathrooms, and two-car garages. These low-maintenance homes have open floor plans for entertaining and have optional covered patios. Duplex villas are available on a resale-only basis. Homebuyers can choose from four distinct floor plans from the Spring Collection. These single-family homes offer 1,109 to 1,424 square feet of living space. They have one to three bedrooms, one-and-a-half to three bathrooms, and an attached two-car garage. These homes can be personalized with optional second floors that can add more space with bedrooms, bathrooms, and lofts. The Vista Collection features single-family homes that offer plenty of space with optional lofts, sunrooms, screened lanais, and extended garages. These homes range from 1,656 to 2,263 square feet. Homes have two to four bedrooms, two or three bathrooms, and two to three-car garages. The Overlook Collection feature spacious master suites and plenty of options for customization such as basements and gourmet kitchens. These models range in size from 2,050 square feet to 2,597 square feet. These single-family homes have two or three bedrooms, two to three-and-a-half bathrooms, and two to three-car garages. I love living here! I have the greatest neighbors and the amenities are outstanding. There are a variety of clubs and activities to join. If you can’t find something to do here, you are not trying! This is one of the nicest and most beautiful settings of any Del Webb I have visited across the country. I love the lake so that probably has something to do with it. The access to the marina is brilliant and offers such a unique amenity you don't find in most active adult communities. There is a really cool event center situated right in the trees looking down on the docks that is perfect for a gathering or party and the main clubhouse is as nice as any I have seen. The local shopping is excellent and all of the surrounding high-end resorts make this area very attractive. Can't say enough about this community. It you love the idea of living on a lake but don't, or can't, invest in lakefront property then this is the community for you. We always wanted to live on a lake or at least near water but the cost of a waterfront property can be outrageous and at this age we didn't want to maintain all that property anyway. Our home here is fantastic and we can walk right down to the lake anytime we want. We love being on the water or just enjoying the sunset ... it's nearly in our backyard! The clubhouse is really impressive too with all the fancy amenities you would expect in a Del Webb community. We looked at all the other Del Webb communities around Atlanta and while they are all really nice, we just fell in love with the combination of everything Del Webb offers PLUS being right on the lake is a perk you will not find anywhere else. 55places.com is not affiliated with the developer(s) or homeowners association of Del Webb at Lake Oconee. The information you submit is distributed to a 55places.com Partner Agent, who is a licensed real estate agent. The information regarding Del Webb at Lake Oconee has not been verified or approved by the developer or homeowners association. Please verify all information prior to purchasing. 55places.com is not responsible for any errors regarding the information displayed on this website.